The memorial is located on the grounds of Highland Memorial Park, located at 14875 West Greenfield Avenue, New Berlin, Wisconsin 53151. NOTE: The memorial is located in the southwestern section of the cemetery. 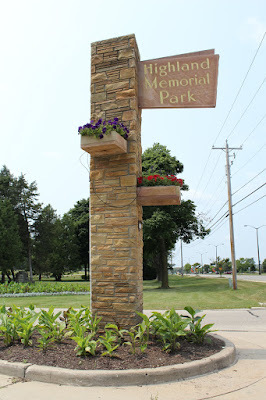 The above coordinates will lead you to the memorial's exact location inside Highland Memorial Park. The north side (above and below) of the memorial. Looking east at the memorial.